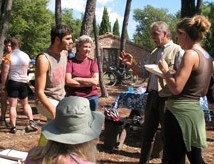 Discover the countryside of Maremma Tuscany on foot, on horseback, by bicycle or on foot. Explore former country seats of the aristocracy and old crumbling farms. Wander among ancient monasteries, through medieval villages, primeval woods and along blossoming medows. Feel the cool mountain air, the warm southern sun on your skin. Never far away is a clear river, and from the next mountain you are bound to see the sea. 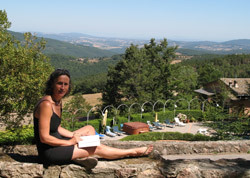 Here in the heart of the Alta Maremma Toscana,Tuscany, one finds the Hotel Prategiano. The historical symbol vision both to the inside and to the outside, into the future and to the present . Newcomers immediately experience the peacefulness that emanates from this countryside. Former strangers quickly become friends. Sport and activities are the foundation for deep friendships. The daily midday picnic offered by the hotel wakes the Italian love for life and a certain southern lightness of being. Spend the evenings sitting around the fireplace in the lobby of the hotel discussing programs for the next day or reminiscing over the past day's activities. While dusk creeps over the mountains, the slopes of the "Poggio " are once more silent, but for the song of the nightingales and the cries of the owls. The coming days promise new views of this awesome countryside and its joy for life. The Maremma — crystal-clear waters, countryside filled with Tuscan cowboys , natural oases and wild hillsides. Numerous trails cover the most beautiful parts of the area and are not just for hikers, but bikers and horseback riders as well. this territory offers.